Samsung just released their new Samsung Galaxy Buds, Apple is also rumored to be releasing a new version of their AirPods and now we have a video of Apple AirPods vs Samsung Galaxy Buds. 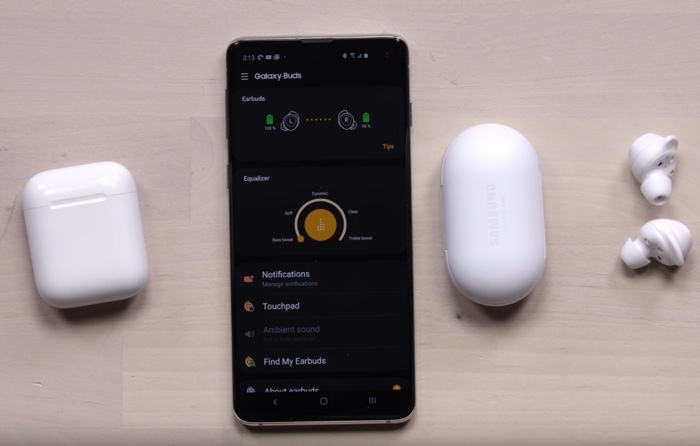 The Apple AirPods vs Samsung Galaxy Buds was put together by Unbox Therapy and it gives us a look at the two devices side by side. As we can see from the video the new Samsung Galaxy Buds have a number of different features over Apple’s AirPods, the app looks very useful and comes with a range of settings. Apple is rumored to be releasing its Apple AirPods 2 some time soon, it will be interesting to see what upgrades they get. It looks like the new Samsung Galaxy Buds may end up being popular.